Are you enjoying the sneak peeks this week from Taylored Expressions?! 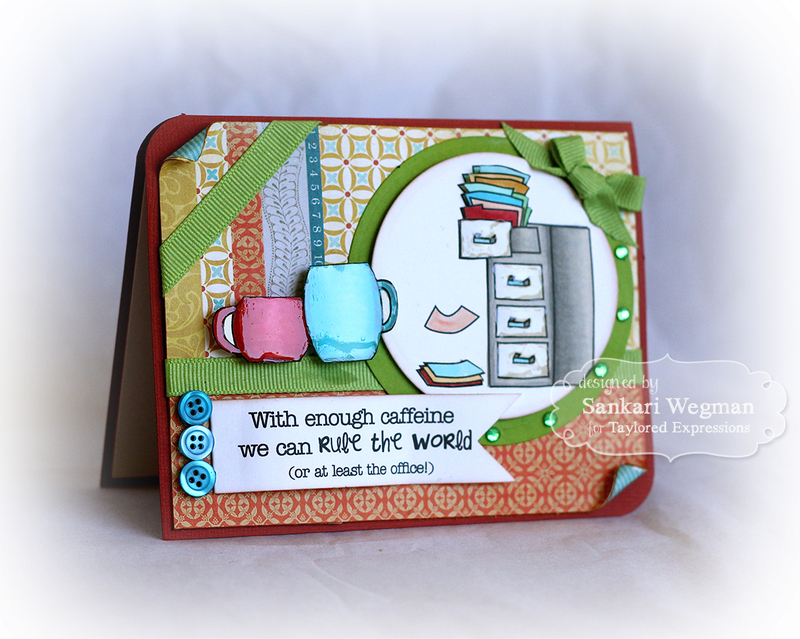 Well today there are more peeks from team and today I am featuring the super cute stamp set Work Place Wishes that was concerted by our dear Wanda to create awesome cards for co-workers! Here is a closer peek at the coloring of the cups and filing cabinet - I added a little bit of glaze to the fronts of the filing cabinet. As I was coloring it, I remembered being in my dad's office after school - he would give me one drawer in his filing cabinet for me to put whatever papers and knick knacks I wanted too... I can still feel the cold of the drawers and hear the slight screeching of the cabinet drawer :) To the side of the filing cabinet image, I added a little row of bling with a little bit of ribbon. There are so so so many fun peeks and images in all of these stamp sets that will be released on Thurs and I can't wait to see what all Baker's Dozen lovies have created with new release stamp sets! Please hop over with me and check them out!! And please hop over tomorrow and check out more of the August releases!! Thanks so much for stopping by today! 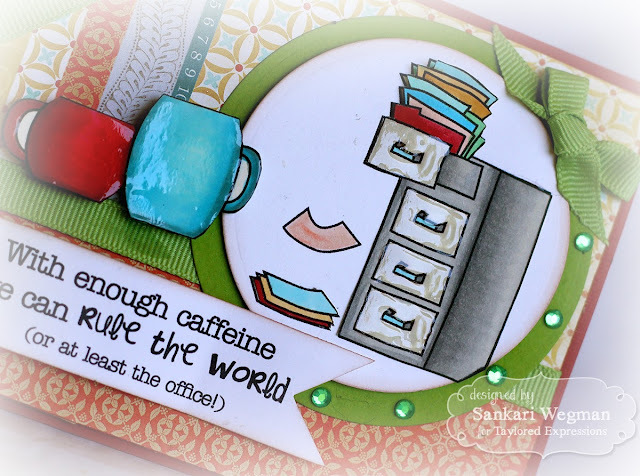 This is sooo cute, Sankari...your coloring is gorgeous and I love how you added the glaze to the cabinet fronts!!! Love the glossy look on the card, great dimension. Fun card!